Water consumption is an essential part of survival. Depending on the circumstances the average adult can survive 3-4 days without water. With a prolonged absence of water, the blood in your body loses its ability to deliver nutrients and oxygen to vital organs, your blood pressure drops, and the body is not able to sweat which will lead to overheating. Under these conditions death will eventually occur. Depending on the environmental conditions and age of the person, survival may be even less then 3 days. A child, an elder, or someone that is in poor health will perish more quickly. That being said, it would be essential to prepare yourself for a survival situation by including water purification methods to your list of survival gear and in your bug-out bag. The Katadyn Vario Microfilter Dual Water Purification hand pump eliminates bacteria, protozoa, cysts, algae, spores, sediments as well as reduces chemicals and improves taste and odor. There is a “fast flow” setting which produces two liters per minute or the “longer life” flow setting that produces one liter per minute. The longer life flow involves the use of a ceramic disc that pre-filters out the dirt. Microbiological containments are then removed by the glass fiber membrane and a replaceable carbon granulate. Price: $95.96 – Use Coupon Above for Greater Savings! The MSR AutoFlow Gravity Filter eliminates bacteria, protozoa, cysts, algae, spores, sediments as well as reduces chemicals and improves taste and odor. 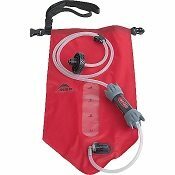 This filter comes with an MSR bag, tube with filter and conection cap that fits standard sized water bottles and bladder bags. One of the easiest water purification methods to use water purification tablets. They are small, light and easy to use. Drop one in a litter of water, wait 30 mins and walla. Only downside is the taste. Water purification tablets use iodine to sanitize the water leaving its less then tastey flavor. All and all, water purification tablets are still worth having on hand as an alternative method to purify water. For those of you who expect to be on the move, the best water purification device options are either the water pump or gravity filter. The water pump works by placing one end of the tube in a water source that is connect to a container with a hand pump. While user is pumping, a suction is created that causes the water to be sucked up the tube, through a filter, and then deposits it into a container. A gravity filter utilizes two bags joined by a tube. The bag of unfiltered water is raised above the “clean” bag causing the unfiltered water to naturally use gravity to force the water through a tube and filter and into the clean bag. A gravity filter allows for clean water to be produced in large quantities for those larger sized survival groups. The filter is also lightweight serving as a go-to water purification method for the a survivor on the go.